On CNBC Meets, which aired on March 20th, 2013, the former United States President, Bill Clinton, publicly expressed regret for the second time on the US failure to stop the 1994 Tutsi genocide under his Administration, also referred to as “the preventable genocide.” President Clinton told CNBC that if the United States had intervened in Rwanda during the genocide, at least one-third or roughly 300,000 lives could have been saved. Clinton explained that the failure of his Administration to act during the genocide, which claimed the lives of around a million Rwandans, was one of the reasons behind the establishment of the Clinton Foundation. This statement follows Clinton’s historic apology speech pronounced in Kigali in March 25th, 1998. “It may seem strange to you here, especially to many of you who lost members of your family, but all over the world there were people like me sitting in offices, day after day after day, who did not fully appreciate the depth and the speed with which you were being engulfed by this unimaginable terror,” said the US president 15 years ago on the tarmac of the Kigali International Airport. In the same regard, international political leaders such as former United Nations Secretary-General Koﬁ Annan, and Belgian Prime Minister Guy Verhofstadt, have issued apologies of the same nature. Clinton’s apology leaves us with several unanswered questions especially in the eyes of over 309,000 survivors of the 1994 genocide. What exactly prevented Clinton and other international political leaders from intervening? Additionally, what type of work is the Clinton Foundation doing to mitigate the longstanding consequences of genocide in the lives of survivors? While symbolically appreciated, the people of Rwanda need action. These apologies do little to heal the wounds of survivors, many of whom are still in a desperate situation, without food and shelter, access to medicine, or means of a livelihood, and enduring acute trauma. President Clinton, like many in the international community, acknowledge their responsibility for the genocide, but need to do more to turn their words into actions – and to honor the memory of the one million people killed on their watch, and help restore the welfare of those who survived. Since 1995 survivors have been progressively claiming their right to reparation. Reparation would mean an acknowledgement of their suffering, and materially restoring their lives. The theme for 19th commemoration of the genocide, just a few weeks ahead, is “kwigira” or self-reliance. This is one of the main objectives of reparation and should ultimately be the goal of the apologies offered. If that reality is ignored, apologies risk rather being perceived as empty slogans.With the right support and the effective participation of survivors, the concept of kwigira will move beyond an abstract idea to a concrete reality. This particular time presents President Clinton and other international political leaders with the opportunity to honor the values of the international community exists and make a difference in the lives of genocide survivors. One powerful avenue to do so is through supporting the survivor’s ongoing international campaign for reparation leading up to 20th commemoration of the 1994 genocide in 2014. This period will also mark the closure of the International Criminal Tribunal for Rwanda (ICTR), the only international vehicle for justice set up in the immediate aftermath of the Tutsi genocide to prosecute those most responsible genocide suspects and render justice to victims. 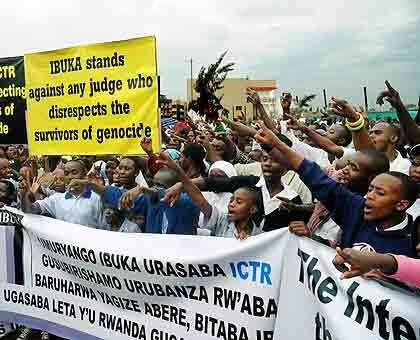 Despite being in existence for close to two decades, the ICTR has never recognised the rights of victims to reparation and effective participation. This despite several requests made by consecutive judges of the ICTR to set up a victim’s compensation fund. By delivering reparation to victims or their families, governments and international political leaders like President Clinton,can demonstrate that their apology is sincere. This piece first appeared on SURF’s website: “Regret,” last modified March 20th, 2013, http://survivors-fund.org.uk/news/regret/.